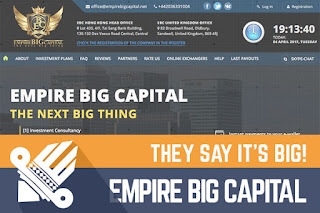 DavidNews HYIP blog - News & Reviews: Empire Big Capital – They say it’s big! Empire Big Capital – They say it’s big! Today I’m reviewing a HYIP project, which tries to impress me with a golden crown, golden wings, and diamonds right from the very beginning. Sure, the name Empire Big Capital fits these flashy visual images and luxury lifestyle impression. The project has been online for seven days. Moreover, it joined DavidNews.com Golden Stage listing four days ago. It’s fresh, and I’m eager to see, which way it will develop in the next couple of weeks. I have reinvested in this program $400 and will keep you updated if the program is paying or not. In the meanwhile, let’s look what’s behind these promising skyscraper images on the home page of the website! Just like the previous program, this company has been registered in the Great Britain, and if you read the review, you already know it’s not a very complicated thing to do. However, there are programs faking numbers or hiding the fact if they are registered. Therefore, Empire Big Capital looks much better with its two registration certificates on their website – one in Great Britain, but second – in Hong Kong. Unfortunately, I wasn’t lucky enough to find a public register in Hong Kong, but Great Britain registration details on the UK online company register were present and matched the details on the website. What’s the story behind the skyscrapers and golden crowns? Not much, I must say. Project owners don’t explain in detail industries where your deposit will be invested. However, they claim that Empire Big Capital is involved in a wide-range of business fields that are very close to the venture capital industry. Moreover, they mentioned a contingency fund, which is ready to cover all losses in case of an unsuccessful launch of the project. Sounds great, but we all know there is a 0% chance that any HYIP has such fund. Therefore, read between the lines, to make independent assumptions. In terms of web design and layout, this is another so called semi-responsive website, which scales image size according to the device. However, the problem is that on smartphones I’m being forced to zoom text, navigation items and other important information on the website. In fact, I just realized that the logotype of Empire Big Capital reminds me some other HYIP project. Of course, I have seen and reviewed so many of them, and it’s hard to recall the name of it, but it looks very familiar. Nothing unusual about the web design and layout – logic content structure and content pages, which provide most valuable information for the potential investor. A website like the previously review website is built using a licensed H-script. How is Empire Big Capital performing on social media? You can guess if there is much communication going on about seven days old program. In fact, there is some activity on social media. Facebook profile with approx. 1500 likes and 5 posts. Twitter account with 5 tweets and 26 followers seems legit because they are following 64 profiles, which might lead to few returning followers. Moreover, they are targeting Russian speak audience on Vkontakte - 30 followers and several posts, but communication is in English. In other words, they have resources to communicate only in English on social media and on the website as well. Probably, they have prior experience and know what they are doing. It’s all about the money. Therefore, let’s look at Empire Big Capital investment plans. At first sight, I saw four plans and said to myself: “Huh, only 4!”. In fact, there are nine of them, which makes it more complicated to a potential investor to understand, which one is the best. I would like to make your life a bit easier by structuring this mess in some sort of order. There are a few main factors, which I always mention when checking investment plans of any HYIP: minimum and maximum deposit, interest rate payment days – all or just calendar, interest rates, investment term for plans with daily revenue % or after how many days you can withdrawal your deposit. It’s very important because often you will notice both types of plans in the same program and the Empire Big Capital, is not an exception. Mine advice to you is always paying attention to daily profit, which is not easy to calculate in all cases. Most of the time investment plan calculators will show you the overall profit. Again, this project is not an exception. However, I have made a few basic calculations, to give you an insight of a daily profit for first three plans. They all have a different minimum deposit, and I have chosen deposit of $1000, to understand what’s a daily profit for these plans. Daily profit for the first plan EBC-D15 is $21.5. For the second, EBC-D25 – 24.5, but for the third EBC-D35 – 29.53. At the end of each of these investment plans, you can withdrawal amount of 1322.5, 1612.5 and 2034.53. Of course, remember to extract deposit of $1000 and only then you can see what’s the real profit. In the meanwhile, investment plans EBC-A3, which has 105% interest rate will make $50 from 1000 after 3 days, which is 16.66 a day. Here you can see the actual daily profit, which is behind these figures. Remember, I’m here to explain how things work, but not to give you any advice, which is the best program or plan. In fact, there are no HYIP’s or plans to be called the best! Just to sum up everything; the website and content have a logical structure. Even though they are using this confusing approach of different plans, which might be difficult for beginners, you can easily see the overall profit calculations on the Empire Big Capital website, but you will not see daily profit calculations there. As I mentioned earlier, the logotype reminds me of some old program. If it is the case, then someone might be back to make some more money. However, I’m not sure about this, because there are so many new HYIP’s every day. I wouldn’t invest my money in any other plans than mentioned here because they just had low daily revenue. Remember, all HYIP’s are made to earn money for the owners. There is a possibility of earning some money, but it’s very unpredictable and risky. Therefore, always evaluate investment risk and invest money that you can afford to lose! Investment plans: 2.15% up to 2.95% daily for 15 up to 35 calendar days, initial deposit returned at the end of the investment term. 105% after 3 calendar days, 115% after 7 calendar days, initial deposit included in the payment. Ignore other investment plans. Join Empire Big Capital Here! At Bonus Bitcoin you may recieve free satoshis. Up to 5,000 satoshis every 15 minutes.